Peruvian friends: Students from Clairvaux MacKillop College wandered through Lima, Peru, with a group of local young people. SILENCE struck 16 Catholic school students when they gazed at the list of 70,000 people killed or abducted in Lima up to three decades ago. Peruvians call the monument, “The Eye that Cries”. It preserves the memory of thousands who were killed or disappeared when terrorists roamed the city in the 1980s and 1990s. Immortalised on one of the 70,000 stones is Josephite Sister Irene McCormack, who was shot to death in 1991 by guerrilla terrorists. Lima’s commemorative shrine of martyrs was among hundreds of unforgettable sights students and staff from Clairvaux MacKillop College, Upper Mt Gravatt, witnessed when in Peru in September. Student Ashlee James said the trip to Peru was a “journey into the unknown”, something both scary and exciting. “Being able to go on this amazing trip at such a young age is something so incredible that I’m so grateful for,” Miss James said. Sr Katrina van Ruth and Sr Mary Dwyer, two of the 12 professed Josephites living in Peru, welcomed the school to a mission centre in Jicamarca. There the sisters have built a centre in honour of their foundress, St Mary of the Cross MacKillop, to help children and young adults. “This is the third time that a group from the college has come to spend time with us and to help us in some of our projects before heading off to see some of the special sights in Peru such as Machu Picchu and Lake Titicaca,” Sr van Ruth said. Unlike a Contiki tour, the students and staff were in Peru to be with the poor, a trip organised by local Latin America Tour Group guide Horacio Passeggi. “Each day that the students were with us (apart from Sunday), they began their day with a Spanish class, learning some basic phrases to use as they greeted people or shopped in the local markets,” Sr van Ruth said. “With funds raised at their college prior to their trip, they purchased enough non-perishable food to fill eight bags which we are distributed to needy families. Sr van Ruth said the young students roamed the city paired with local Peruvian young adults, a sign of connection between Australia and Peru. “It was wonderful to see the interaction of the young, overcoming the barrier of language, and thoroughly enjoying each other’s company,” she said. The Josephite Sisters said they were grateful for “the life and energy of the group”. Mr Passeggi said it was a blessing to travel with the group to Peru, which is part of his company’s School of Life program, offering immersion trips to Catholic school students. “Everybody grew in their faith as well as in their knowledge that we live in a very fortunate place on Earth and that every little bit of help we can give to others means a lot to the ones who receive it,” he said. 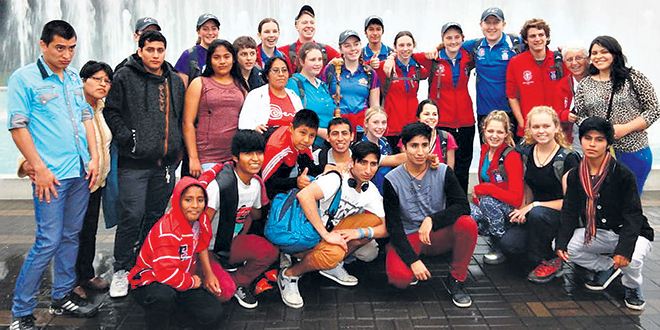 Correction: The Catholic Leader reported that 16 Catholic schoolgirls attended the trip to Peru, despite the visit to South America undertaken by 16 co-ed Catholic students from Clairvaux MacKillop. The Catholic Leader apologises for this mistake.